With AirPower still out of the picture, accessory makers have rolling out their own solutions to the market to capitalize on the vacuum. Nomad is just one of the latest to try their hand at a multi-purpose wireless charging station, and it is easily the most successful yet -- although it does leave watch owners out in the cold. There are two main aspects to any charger -- charging prowess and aesthetics. Let's dig into both of those, starting with the specs. There are four outputs on the Nomad Base Station. Dual 10-watt wireless chargers, a 7.5-watt USB-A port, and an 18-watt USB-C port with Power Delivery all make an appearance. The usual chargers may have a USB-A port, but limit it to 5W. They also may have USB-C, but lack Power Delivery. Others have multiple Qi coils, but are limited to 5W on iPhones. Nomad sidesteps all of these common pitfalls. There are a total of three charging coils on the top -- one to the left, one to the right, one in the center. 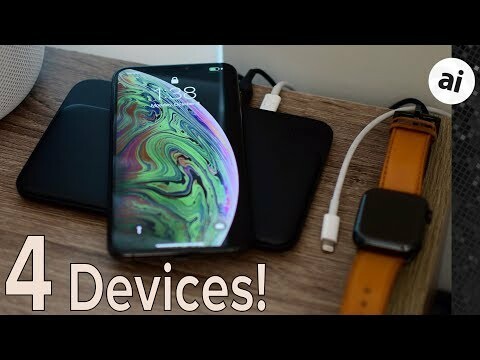 When placing your device, you have the option of charging two phones perpendicular to the body or rotate a single phone horizontally and charging it laying completely on the leather. What is interesting about the coils that are used, is their placement requirements. When any company designs a charger, they have the option of choosing how picky the coils are about phone placement. In other words, how centered the phone must be before it is able to charge. In a lot of other chargers, the placement radius is larger, which gives users more leniency. The downside is that the farther off center the more the charging speed is reduced. To keep the speeds fast and consistent -- 7W on iPhones, 10W on compatible Android handsets -- Nomad tightened up the radius. It is a bit more specific in placement, but charges quickly, and reliably. Nomad's Base Station has leather covering the coils themselves, giving it more of a premium feeling than others on the market. Most of the remaining body is made of molded aluminum. On the front, are LED status lights. Usually, we are annoyed by the brightness of these lights, but Nomad smartly included an ambient light sensor to adjust the brightness based on the conditions that surround the charger. This is a neat trick they picked up when creating their Tile-equipped portable power bank. The bottom of the charging station has rubber feet, which prevents the whole apparatus from moving around. All the ports are around the back, including the power input, and the two USB outputs. Nomad's included power brick is quite large and took some maneuvering to fit into our already in-demand outlets. The good news is, we were able to remove a couple chargers because of how many outputs the Base Station contains. We've used Nomad's multi-charger for a while now, and are pretty happy with how it fits into our lives. We use the USB-A port for our Apple Watch charging puck, and the 18W port we save for our iPad Pro. Apple's USB-C Lightning cable, charges our 12.9-inch iPad Pro quite fast. There are disadvantages. On our nightstand and desk, this leaves several cords coming out of the back of the charger which can look untidy -- especially the Apple Watch cable which is unnecessarily long. If Nomad made the charger a tad longer and integrated an Apple Watch puck somehow, that would certainly be ideal. That could even keep that USB-A port open for anything else we may need to charge. Even though the Qi charging radius is smaller, we had no issues placing our phones on the charger. The size of the charger is also almost exactly the same size as the iPhone XS Max, which is perfect for our new phone. We love the ability to turn the phones perpendicular to the orientation of the pad and charge two phones at once, or an iPhone plus our AirPods using the Hyper AirPods Qi charging case. Chargers are necessary, and wireless has certainly made things easier and look less cluttered. Nomad has a well-executed option for many to consider, with extremely fast power through all four outputs. We love the premium materials, svelte design, and output options, though wires are strewn about. If Nomad included some form of integrated Apple Watch charger, the Base Station would be the perfect multi-device charger. Nomad has the Base Station available to order now for $99.95. Not the cheapest wireless charger by any means, but with all four outputs, can easily be more affordable than picking up each of those indivudually. What AW puck charger are you guys using on the video? Order placed! Thank you for the information! Looked interesting — right up until the term 'power brick' made its unwanted appearance. Hmmm... how else would they be able to power a total of 43w to 4 devices without a proper power adapter? Were you thinking they included it in the slim hub? For me, that seems like the trade-off.